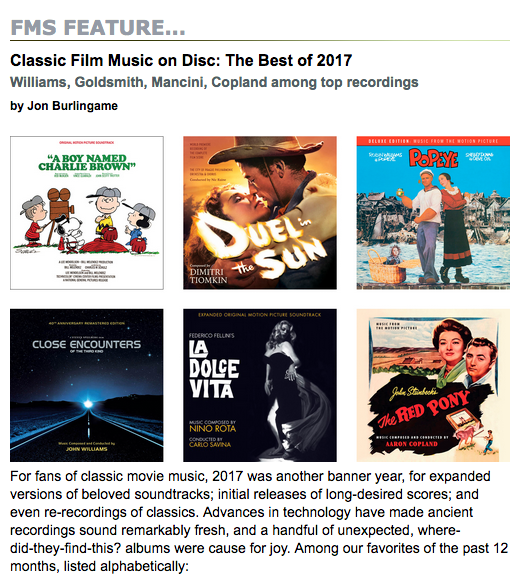 One of my favorite end-of-year assignments involves choosing the top 20 albums of “classic film music” released during the previous 12 months. This year’s task seemed harder than ever, because several labels gave us truly remarkable discs — some of them expanded classics, some previously unreleased scores, some of them reissues of very rare LPs. I enjoyed all of these, from the music of John Williams and Jerry Goldsmith to that of Aaron Copland and Vince Guaraldi and many more. The list spilled well over the 20 slots, so I added an “honorable mention” paragraph to sneak in a few more titles. 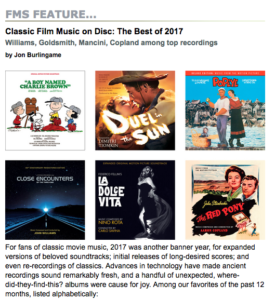 This entry was posted in Uncategorized and tagged Aaron Copland, Best Film Music of the Year, Best of 2017, classic film music, Film Music Society, Jerry Goldsmith, John Williams, movie soundtracks, top movie soundtracks, top soundtrack albums, Vince Guaraldi on December 28, 2017 by Jon Burlingame.